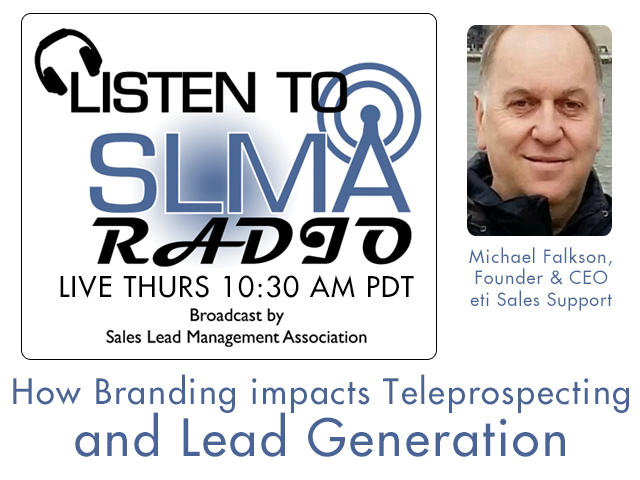 Michael Falkson, founder of eti Sales Support makes the case that those that ignore branding do so at their peril. He believes too many marketing manager's think that branding is an expensive exercise that has few measurable benefits for the small to mid-sized company. Falkson argues that branding and its benefits make the sales process much easier and he tells us how to do it. The host for this show is Jim Obermayer. Founder and CEO of eti Sales Support, Michael Falkson leads the company's strategic direction. An entrepreneur at heart, Michael emigrated from South Africa in 1987 to establish eti. eti is a premier B2B Sales and Marketing support agency. eti has been a leader in the field since the company's inception, innovating and deploying cutting edge technologies, which include stateoftheart CRM, PRM and Marketing Automation solutions geared towards maximizing sales productivity. Prior to leaving South Africa, Michael was the CTO for Effective Letters Pty. Ltd, SouthAfrica's leading Direct Mail Marketing agency, and CEO and founder of ETM Pty Ltd, which was the largest Call Centre operation in the country at that time. He was also the founder and Chairman of SATA (South African Telemarketing Association) until emigrating to the US.Michael studied at the University of Witwatersrand in Johannesburg and the Hebrew University in Jerusalem. Whether you're just beginning to grow your business or you already have a thriving national or global business, eti has the resources, the experience and the services to help you expand.We're a leading business-to-business sales support agency specializing in programs to maximize clients' direct marketing and sales growth nationally and globally. Founded in 1987, we have a record of success in increasing clients' sales with New Customer Acquisition as the most important aspect of our many sales driven services. Our Business Developers are college-educated with most having extensive previous business experience. Our clients profit fully from their successful abilities in conducting sophisticated programs that require knowledge, intelligence, business insight and communication skills to produce the best results. Our core competence is in consultative business development, primarily for clients with complex products, services, and value propositions. To grow client sales by maximizing sales productivity. To provide high-quality, responsive, (global) business-to-business sales support services via a growing pipeline of sales opportunities. To provide leading-edge, real-time reporting and analytics that offer clients optimum control and accountability to maximize returns on their marketing investments. To provide highly effective leadership and support for integrating sales and marketing campaigns.